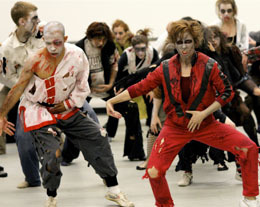 Dance to Thriller -- A dance rehearsal for "Thrill The World" will be held in the Wyoming Union Friday, Oct. 23, from 9 p.m.-1 a.m. The performance is the next night at 6:30 p.m. in the Arts and Sciences auditiorium. A world-wide simultaneous dance to Michael Jackson's classic "Thriller" is coming to the University of Wyoming this weekend in two phases. A dance rehearsal for "Thrill The World" is part of "Friday Night Fever" activities in the Wyoming Union Friday, Oct. 23, from 9 p.m.-1 a.m. And as part of Alcohol Awareness Week, Cowboy CHOICES 180 Peer Education Team members will be serving "mocktails" to participants that evening. Participants will then perform the dance Saturday, Oct. 24, at 6:30 p.m. in the Arts and Sciences auditorium. Doors open at 6:15 p.m.; the performance is free and open to the public. "This is a world-wide simultaneous dance, where thousands of people are expected to dance to ‘Thriller' at exactly the same time all over the world," says Dan Socall, UW Counseling Center director who also helps organize the event. "It's hard to watch ‘The Thriller' dance video and not want to learn how to do it." Socall, who normally interacts with students as a counselor, says dancing "The Thriller" with UW students is energizing and helps demystify counseling. More than 400 dancing events in 42 countries are expected to have between 10,000-50,000 dance participants worldwide take part in Saturday's event. This is the second year UW has taken part in the dance.